After two days of Brexit bludgeoning, U.S. and European stocks clawed back some lost ground early Tuesday. Benchmark indexes in London, Paris and Frankfurt all rose more than 2% in morning trading, while U.S. stocks rose about 1%, with the Dow gaining almost 200 points. In another sign of appetite for riskier assets, crude oil rose 2% to above $47 a barrel. The pound, which has been pummeled since Brits voted in favor of leaving the EU, climbed against the dollar to above $1.33. But major European and U.S. stock indexes are still firmly in the red since Thursday's close, before the shock result of the U.K. vote emerged. The pound is still down around 11% and hit its lowest level in more than 30 years on Monday. 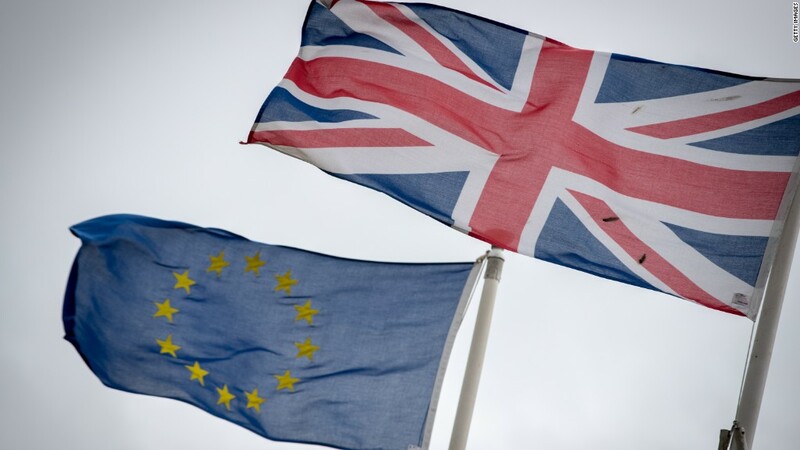 "Markets are bouncing, and can bounce further but the clouds on the horizon are dark, and they're real," said Kit Juckes, strategist at Societe Generale, noting that the U.K. has "no plan for the future." The Brexit vote sent shock waves through global financial markets, which lost $3 trillion on Friday and Monday in the worst two-day rout on record. Uncertainty about how the unprecedented situation will play out has left investors trying to figure out how to position themselves. "We're still in the early days," said Andrew Sullivan, managing director of sales trading at Haitong International Securities in Hong Kong. "It's going to take some time to dampen out these oscillations." Asian stock markets tried to shrug off some of the Brexit gloom earlier in the day, with major indexes posting a mix of small gains and losses. Hong Kong's Hang Seng dropped 0.3%, while the Nikkei in Tokyo ended 0.1% higher. Stocks seen as having strong exposure to the U.K. again bore the brunt of selling. Nomura, a Japanese investment bank with significant operations in London, fell 1.7%, while CK Hutchison, a Hong Kong-listed company that owns a range of U.K. businesses, sank 2%. Fragile market sentiment wasn't helped Monday by Standard & Poor's two-notch downgrade of Britain. S&P specifically cited the Brexit vote, warning it will hurt the U.K. economy, deter investment and make it harder to finance the country's large debt load.